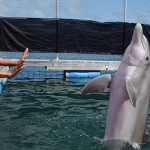 In the marine world, animal training has primarily been limited to marine mammals, though scientists have attempted to train other marine animals with limited success. including dolphins, seals, sea lions, walruses, and sea otters. Marine mammal trainers use positive reinforcement (e.g. operant conditioning) to train animals in their care. Educational shows, demonstrations, and/or interactive programs that showcase animals, their learned behaviors, and the trainers that work with them, allow the public to develop an understanding (and respect) for marine life. Marine mammal trainers may also teach behaviors to individual animals that make it safer and easier for veterinarians to collect medical samples, perform exams, and administer medications. Marine mammals can also be trained for military and/or research purposes. Animal trainers are responsible for the physical and mental health of the animals in their care. It is important to note that a trainer usually does not spend their entire day interacting with their animals. Marine mammal trainers are responsible for feedings, pool maintenance, medical tests/animal health, recordkeeping, as well as ensuring that their animals have daily physical activity, mental enrichment, and social opportunities. Marine mammal trainers may work in aquaria, zoos, university research laboratories, industrial research centers, private companies, government research laboratories or marine stations. Since marine mammal trainers tend to be secure in their position and are close with the animals with which they work, job turnover is low. Once people take a job in this field, they tend to stay in their position for a long time. Additionally, relatively few new marine parks and aquaria open each year. Thus, marine mammal training is a very competitive field, requiring a great deal of patience and dedication. Often people work in other departments, such as education, operations, and/or maintenance, before transferring to a job in animal training. It is important that trainers are well rounded, both academically and physically. Marine mammal trainers work indoors and outdoors, depending on the type of animals in their care. If outside, they conduct their work regardless of weather. Marine mammals produce a wide variety of sounds including clicks, whistles, buzzes, pulsed sounds, pops, and yelps. These sounds are used for communication , feeding, and navigation . Marine mammal trainers must have an understanding of how marine mammals produce sound and use sound in their environment. Trainers also use sound to communicate with their animals. Trainers use several acoustic tools to help them work with their animals. A “bridge” is a stimulus (either a whistle or verbal stimulus such as “good”) that a trainer uses to communicate the exact moment an animal performs a correct behavior. The term “bridge” is used to describe the stimulus because it bridges the gap between the behavior and the “reinforcer”, something the animal enjoys (e.g fish, toys, and/or rubdowns) which increases the likelihood that the animal will repeat the behavior. This immediate feedback (provided by acoustic stimulus) is important because the animal may be in the water far away from the trainer and needs to know which behavior was correct. After numerous trials, the bridge becomes associated with reinforcement and becomes a conditioned (or secondary) reinforcement. The animal has learned that a whistle or verbal stimulus means it has done something correctly and that it can expect a reinforcer of some sort. Consistency is important. Another acoustic training tool is “recall”. Recall is a sound or vibration sent through the water to get an animal’s attention. It can be a tap on the top of the water, on the side of the dock, or on top of a bucket. When the animal hears the recall it should approach the source of the sound or vibration to receive its reinforcer. This tool is especially useful to move a group of animals to one side of the pool in case of emergency. Sound Production > How do marine mammals produce sound?